What a lot this verse has to say about healthy body life. It focuses on two necessary things. It helps us see each other realistically and not put people on pedestals. It sharpens our consciousness of our own sin. As we hear our brother or sister confess, say, an angry response or unkind word, memories of our own sins surface and we're prompted to clear them up. Such accountability keeps us from repeating such sins in the future as we realize, the angry word that will make me feel better momentarily will just have to be confessed later. So I'd better keep my mouth shut. It gives us prayer fodder. That's the whole point of James' instructions for these interchanges. People who know each other's weaknesses and temptations can pray effectively and fervently for each other. We discover that restoration may take more than our determination and self discipline. 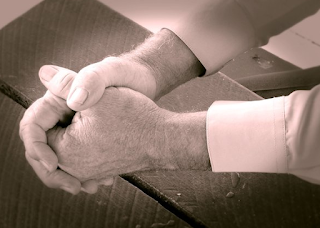 To gain and keep victory, we need the help that comes from God through the prayers of fellow Christians. "… the basic idea is that of a supplication 'having energy.' Effective prayer is characterized by earnestness, fervency, and energy to release results and is illustrated in the case study* the following verses provide" - Jon Mark Ruthven, study notes on James, New Spirit-Filled Life Bible, p. 1758. If we practiced confession to and prayer with and for each other regularly, I think our church life would become much more relevant to real life than the Sunday fantasy oasis it often is when we hide our messy lives behind masks of holiness and self-sufficiency. PRAYER: Dear God, please help me to hazard and nurture authenticity and prayer with my Christian brothers and sisters. Amen. * The "case study" mentioned here is Elijah. We can read his story in 1 Kings 17 & 18. Which Zeresh traits do you have? To whom do we pay homage? Is it wrong to plan? "What was it you disputed among yourselves?"